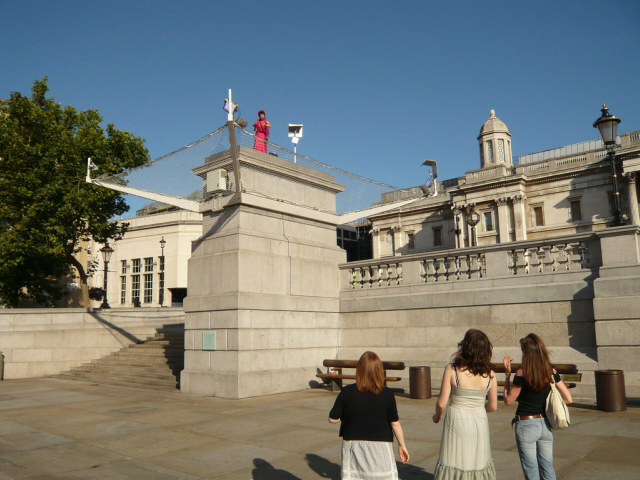 Two Londonistas were selected to take part in Antony Gormley's installation for the fourth plinth in Trafalgar Square. We share the experience, from behind the scenes, in the crane and up above the square then back down again. 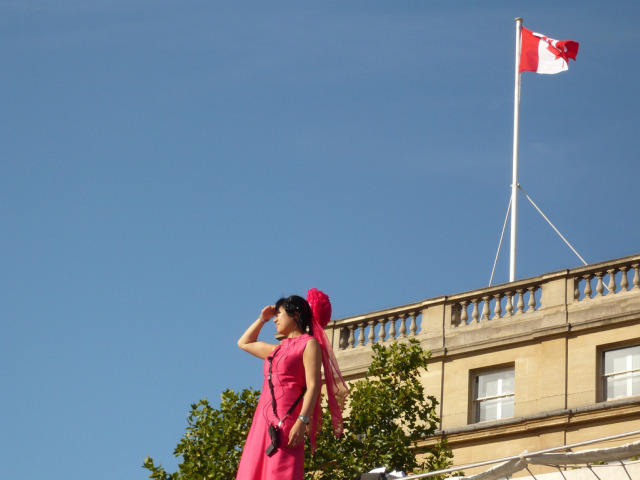 First shift: Hazel Tsoi-Wiles, 8.00am, Sunday 23 August. It was still dark. I quietly picked up my wedding dress, bouquet and headdress and left him sleeping, tiptoeing out to my waiting cab. He wouldn't miss me. We would see each other again. He was my husband. And we had done all this before. 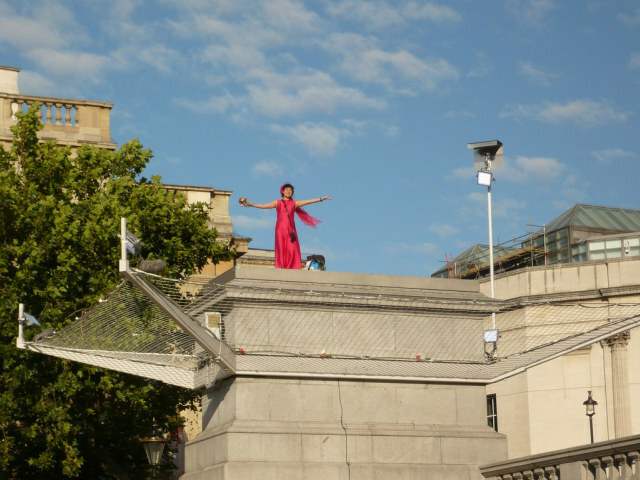 But not quite like this, in Trafalgar Square at 8.00am with me on the fourth plinth, clutching my flowers with big headdress bobbing in the breeze, with friends, family, spectators, tourists and spouse in the square below. 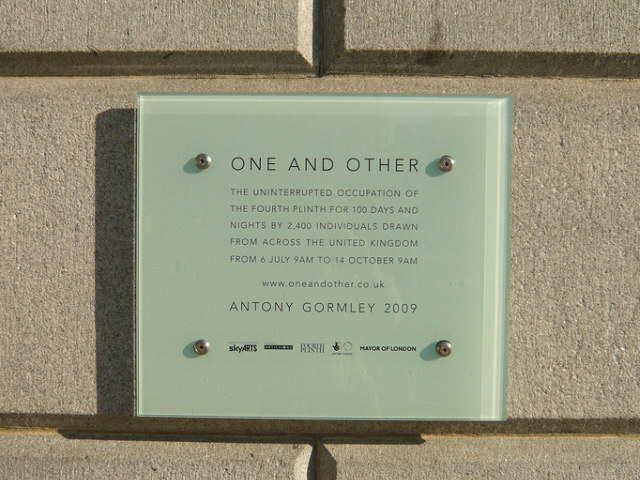 This time, it was going to be for the public, on a Sunday morning, in week 7 of One and Other. This time, I was going to be a bride-shaped art installation. I got changed, had a coffee, then my interview in the green One and Other huts at the south end of Trafalgar, feeling instantly at home with the crew. It was handover time and there were lots of red t-shirts either finishing their night shifts with bowls of cereal and cups of coffee or just getting started with the same sustenance. Everyone there genuinely wanted to be there and exuded enthusiasm and eagerness - except perhaps the tired man sleeping on the sofa, waiting for the first train back to Cambridge after doing his 1.00am to 2.00am plinth stint. The interview was intimate and I at last began to focus on what I was about to do and saw for the first time how I fit in to the much bigger picture. I was going to go up next and be part of the most ambitious, unpredictable and truly celebratory artworks of England. It made me dizzy. And so did the prospect of standing really quite high off the ground on a narrow platform for a solid hour. The JCB was ready and I stepped outside, shielding my eyes from the blazing sunshine and the cloudless blue sky. 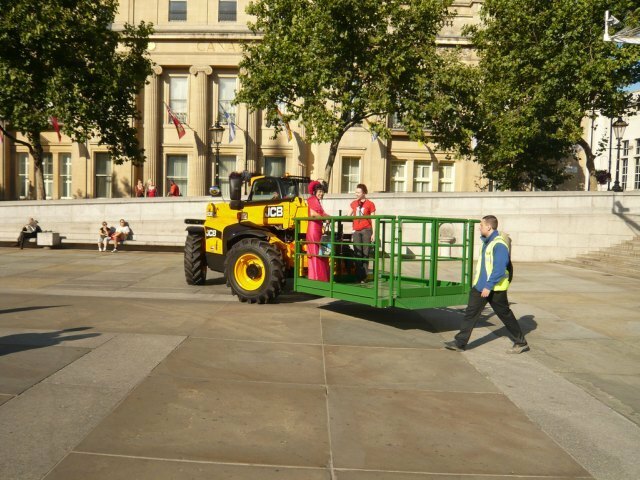 I felt shaky in the cage and had to concentrate on enjoying the slow ride across the square and then the rise up to the plinth. I stepped out, I put down my bag, I straightened up and looked around me. It was high, it was quiet, there weren't many people below, I took a deep breath and unrolled my first banner with a big smile. My parents, aunt and sister were waving up at me, my mother darting about with her camera as proud and beaming as the original wedding day three years ago. My friends were arriving, my husband appeared. A tourist group making an early approach to the National Gallery stopped to stare and snap pictures of me, tentatively waving back when I waved at them. I wanted to hug everybody and shake hands, thank them for coming and wish them a lovely time at my special hour. I think everyone feels it who goes up on that plinth: it's a pedestal and for the time you're on it, you're a work of art, a special edition, a unique specimen and something very special. It's a magical feeling and I feel very lucky to have had that. I unrolled my banners with the details of my wedding day, recalling with each one the thrill of the day. I basked in the sound of my friend Katy singing the arias she sang at the wedding, her voice filling Trafalgar Square and seeming to set off the fountains at about 8.30am. Then it was time to throw the bouquet, in what I hoped would be a better toss than the first time when the bouquet went straight up to the ceiling then landed directly at my feet. There wasn't much of a crowd so there wasn't much of a scramble, and I laughed as one friend triumphantly bore the bouquet away. And then the JCB came for me and I was driven back across the square like a triumphant returning hero of some sort. I got changed into jeans and t-shirt, took the headdress off and stepped back into the square, light-headed with my sense of achievement. There were my friends, my family, my husband and there was coffee, chatter and sunshine. 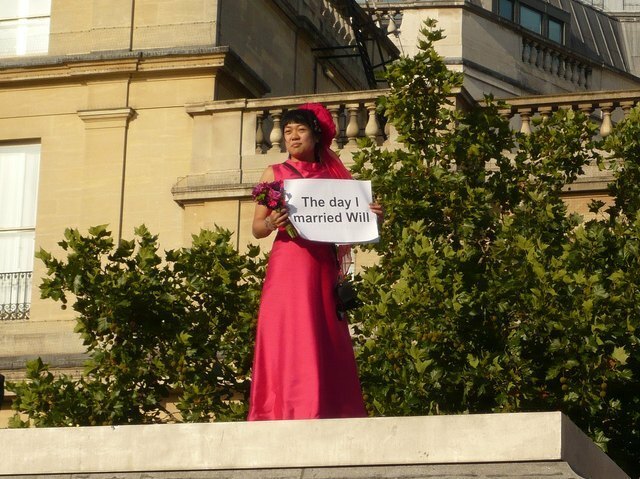 I had had the joy of being up there, a bride again, reliving the day I first felt like an artwork on display, a hot pink symbol of my own happiness and joy. I had been part of One and Other, I had added a little piece of myself to the overall artwork and that experience will always be part of me. 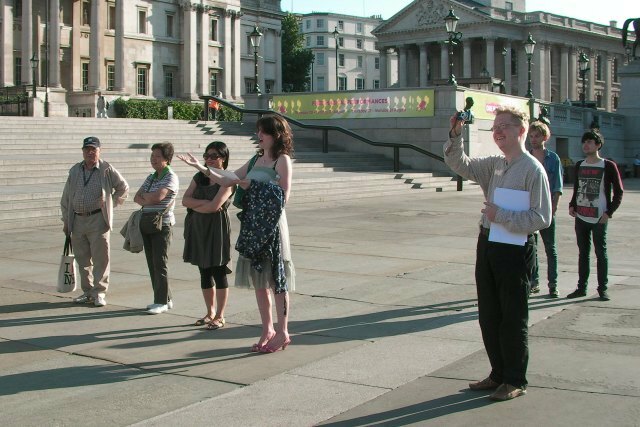 Follow our One and Other experience with the One And Other: Londonist On The Plinth, The Night Shift from our correspondent in the 3.00am slot tomorrow.